Father John Judie started FR. JOHN JUDY MINISTRIES, INC for funding his work in east Africa. He has completed many mission trips to Tanzania, Kenya and Zambia. Having been a priest for over 25 years, my life took a radical turn when I began to be a missionary in – and not to – Central America in the early 1980s. I make that distinction because it was in Central America that I became missionized to the plight of the poor in Nicaragua, Guatemala and El Salvador. I also experienced being missionized in several visits to Chiapas in Southern Mexico. I continue to be missionized by the presence of Latin Americans around Louisville as I am privileged to serve them in various ways. My own mission to Central Americans and Mexicans began in the wake of Vatican Council II. In the late 1960s and into the 1970s I began to study a theology called “Liberation Theology” that was emerging from Latin America. As that interest was unfolding, some priest friends returning from Latin America were telling me that “they were killing them”. From those priests I learned that “they” were military dictators and their death-squads who were killing “them”, namely poor peasants, teachers, nuns and priests, and bishops all over Latin America, including the famous martyrdom of Archbishop Oscar Romero of El Salvador in 1980. Then in 1982 an opportunity to be in solidarity with the suffering people of Latin America became immediately available. It was called “The Sanctuary Movement”. I was at St. William parish at the time when parishioners voted to join this Movement and to house Salvadorans and Guatemalans fleeing persecution and massacres at the hands of their own governments and military. In those years the U.S. government refused to accept Salvadorans and Guatemalans as “political” refugees fleeing death, branding them instead “economic” refugees which rendered them ineligible for asylum. The Salvadoran and Guatemalan governments, backed by the U.S., were notorious for death-squad murders as well as massacres of entire villages, accusing poor people of being “subversives” or “communists” even as they struggled for dignity and safety. Joining the Sanctuary Movement and then housing Salvadorans and Guatemalans was an act of civil disobedience which could lead to fines and imprisonment for parish leadership and parishioners at St. William Church. While the U.S. government would not receive Salvadorans and Guatemalans it received refugees those who were fleeing Nicaragua, proclaiming they were political refugees fleeing a communist government (which from 1979 was led by the Sandinistas who had overthrown the long-lasting and U.S.-backed Somoza-family brutal dictatorship). Shortly after 1982 St. William became a Sanctuary Parish I had my first missionary experiences in Central America. From those experiences I learned first-hand that my government was reversing the realities: Salvadoran and Guatemalan refugees were “political” refugees and Nicaraguan refugees were “economic” refugees. That first chance to see what those realities were came in June/July 1984. I participated in a delegation of 100 interfaith people under the aegis of a newly formed group of U.S. citizens called “WITNESS FOR PEACE”. I joined another WFP delegation to Nicaragua in November of 1984, and subsequently organized and led as many as 15 other delegations to Nicaragua, Guatemala, Southern Mexico, Venezuela and Colombia until the early years of the 21st Century. I also had the privilege of going to Guatemala El Salvador with Maryknoll missionaries several times. The mission of WFP and Maryknoll was to stand with the poor and persecuted people of those countries, to learn from them what they were suffering and also to learn from them who were causing such suffering. These missionary people in Latin America – the thousands of suffering people – taught me that their sufferings were coming from the economic and military policies of my country, while the local dictators and their military death-squads were carrying out those brutal policies. Thus the mission to Latin America became a mission in reverse back to the United States, to make known and attempt to change my country’s economic and military policies inflicting such suffering. After seeing with my own eyes what the poor were suffering I tried to become a voice in the U.S. for those with no voices in Latin America. I lent my voice to inform parishioners in sermons, in visual presentations to civic and religious groups and in writing of my experiences to family and friends as well as articles in periodicals. I also went to the offices of Congresspersons in Washington, DC and in Louisville to express my concerns, which led to being arrested for sitting-in the Louisville office of Senator Mitch McConnell. Through these years of being in Latin America I have learned that my mission not was to convert Latin Americans but rather to allow myself to be converted by them, to be missionized by them, to be in solidarity with their intolerable sufferings and to be courageous enough to proclaim that such sufferings were coming from successive governments of the U.S. during many decades of “Manifest Destiny”. That policy lead to the exploitation and repression of poor people in those countries by local governments supported and equipped by the U.S.
As a U.S. citizen and as a person of religious faith I felt and still feel compelled to speak to my own countrymen and women for people in Latin America who have no voice to speak about the injustices inflicted by my country. Father Joseph F. Hayden, ordained July 14, 1963, has served as a pastor, missionary, a teacher at Trinity High School and St. Thomas Seminary and on the Archdiocese of Louisville’s Metropolitan Tribunal. 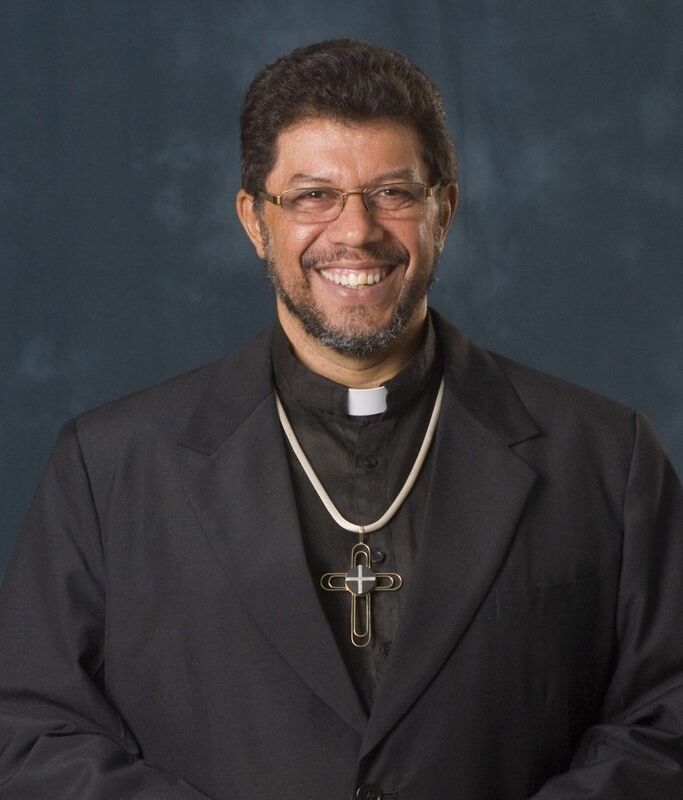 He served as associate pastor of St. Edward Church, Ascension Church and St. James Church in Louisville. He also served as judicial vicar of the Archdiocese of Louisville and as pastor of St. Dominic Church in Springfield, Ky. In 1993, he went to Peru as a missionary. He retired in 2008 and returned to Peru in 2009. He has been ministering in the Diocese of Chimbote. It is a crime in itself that I was not able to find much information about Father Hayden. I did find this article that describes the work of missionaries in Peru. Maybe this will give you a look at the type of ministry he has been doing. On Dec. 5, 2015, three missionaries killed in Peru by communist terrorists — the Polish Franciscan Fathers Zbigniew Strzałkowski and Michał Tomaszek and the Italian diocesan priest Alessandro Dordi — will be beatified. Paradoxically, both the missionaries and terrorists had a common goal: to empower the poor. However, the missionaries saw Christian love as the solution to inequality, while the atheist terrorists chose hatred. Although today’s Peru enjoys impressive economic growth, in the 1980s, the South-American nation was plagued by poverty and violence. As a response to the growing pauperization of Peruvian society, the Communist Party of Peru, called the Shining Path (Sendero Luminoso), engaged in acts of terrorism. It was influenced by the philosophy of Chinese revolutionary Mao Zedong (who killed more people than Hitler and Stalin), positing constant war to liberate the working class. Although the Shining Path made Peru a dangerous country, many European priests chose to become missionaries there. They included Polish Franciscans Strzałkowski (1958-1991) and Tomaszek (1960-1991), who entered seminary shortly after their countryman St. John Paul II was elected pope. Another Polish priest, St. Maximilian Kolbe, who was canonized in 1982, influenced his fellow Franciscans. Although St. Maximilian is best known for volunteering his life in Auschwitz to save the life of a fellow prisoner, he was also a missionary in Japan and used the media to spread the faith. Inspired by their saintly brother, Fathers Strzałkowski and Tomaszek decided to become missionaries and evangelists. “In seminary, we greatly admired Father Kolbe because he was very traditional in his faith and his Marian devotion, yet he was also someone who excellently used new technology for evangelization,” Father Swierczek explained. In 1988, Father Strzałkowski and his fellow Franciscan Father Jarosław Wysoczanski went to Pariacoto in the Peruvian Diocese of Chimbote, and Father Tomaszek followed the next year. In the 1980s, Pariacoto was a poor, remote village in the Andes, mostly inhabited by Indians. Their poverty, however, was not only material in nature: Before the Polish Franciscans established a mission there in 1989, priests would only sporadically come to Pariacoto. As a result, the villagers had limited access to the sacraments. While most Pariacoto residents called themselves Catholics, their Mass attendance was infrequent, and concubines were the norm. The Polish friars’ new parishioners took an immediate liking to them. In 1989, a great drought hit Peru; in response, the Polish friars brought food from the international Catholic charity Caritas to Pariacoto and appealed to charities for infrastructure that would ease access to water and teach the people how to create a local water-pipe network. Above all, however, the Franciscans worked to revive their new parishioners’ faith. They catechized them and showed them videos about the lives of the saints. Young men were encouraged to become altar servers. Naturally, the Shining Path saw this as a threat. In the atheistic Marxist ideology, religion is “opium for the masses” that makes the poor hope for a peaceful afterlife, instead of fighting for better material conditions now. Because there is no God to be accountable to in Marxism, morality becomes relative. Thus murder becomes justifiable. The friars had heard about the Shining Path’s brutality and hatred for the Church. Pariacoto itself was in a state of lawlessness: In February 1990, the terrorists destroyed the local police station. Yet the friars refused to return to Poland or transfer to a safer mission. On Aug. 9, 1991, masked Shining Path terrorists stormed into the presbytery at Pariacoto. They accused the priests of supporting the “Yankee imperialist” Caritas and weakening the people’s revolutionary potential by encouraging religion. The terrorists demanded Fathers Strzałkowski and Tomaszek get into a car stolen from the monastery (Father Wysoczanski was on vacation in Poland at the time). They were driven off into the wilderness and shot. The Polish priests were friends with Father Dordi (1931-1991), who had been a missionary in the Chimbote Diocese since 1980. Previously, Father Dordi had ministered to Italian immigrants in Switzerland and served as a worker-priest in Swiss watch factories. Thus, Father Dordi knew the concerns of the working class. In Peru, Father Dordi served in the Santa parish. Like Fathers Strzałkowski and Tomaszek, he was committed to his parishioners; he was particularly devoted to Santa’s farmers, helping to implement rural development programs. As soon as Father Dordi learned about his Polish-Franciscan friends’ fate, he kept telling his closest collaborators that he knew he would be next. However, he declined his bishop’s offers to return to Italy. Subsequently, the Shining Path considered Father Dordi a threat, too. On Aug. 25, 1991, when he was returning from a chapel in the diocese to baptize children and celebrate Mass, the communists set up an ambush. After Father Dordi left his car, they shot him. In past years, the people of the Chimbote Diocese have grown in devotion to the missionary trio of martyrs, and many claim to have received graces through their intercession. Their devotion will now be rewarded. After the 1991 martyrdoms, the Shining Path failed to attract recruits in the Chimbote Diocese. In the 1990s, the Peruvian government intensified its crackdown on the organization, and many of the Shining Path’s leaders were jailed. The Chimbote martyrs show that, for true social justice to be achieved, it can only be based on Christian love, not on reducing the person to economic categories. Filip Mazurczak writes from the Atlanta area. Italian priest photo, courtesy of Archive of the Sisters of Jesus the Good Shepherd. For the last year, I have been volunteering in the Caribbean country of St. Vincent and the Grenadines (see map above), in the Diocese of Kingstown, under the invitation of its former bishop, Jason Gordon and its present bishop, Bishop Gerard County. I got involved almost by accident. I has been working on a retirement idea at St. Meinrad Seminary when I was Director of the Institute for Priests and Presbyterates. I has thought that it would be a good idea to connect retired priests with dioceses in mission areas like Alaska and the Caribbean. One morning, as I was walking through the dining room at breakfast time, I saw Bishop Gordon going through the cafeteria line. We had both gotten there early before the seminarians came in. I thought I would ask him if he would be interested in having retired priests coming down and helping him our, part-time. I was thinking of others more than myself. Then I decided that I would forget the idea for that day, but doubled back and introduced myself and presented my idea. He was delighted. As it turned out, my program ideas at St. Meinrad did not pan out, but here I am packing for my fourth trip March 31 - April 13, 2016. Others may be invited in good time, but I am plowing the ground. So far, I have given two permanent deacon discernment retreats, one priest day of recollection, delivered two sixteen-passenger vans, celebrated Holy Week Services in one parish, presided and preached at three parish weekend masses, helped sponsor seven youth to go to World Youth Day and attended the ordination of the new bishop. During my last trip, I led the priest and bishop in their annual retreat, spoke to the twenty-one bishops of the Antilles Episcopal Conference in Port of Spain, Trinadad and Tobago (see map above) and give a talk to the seminarians of their regional seminary. I lead the Archdiocese of Nassau Presbyteral and Diaconal Convocation a few years back. Addressing the 21 bishops of the Antilles Episcopal Conference in Trinidad. One of the organizations I helped start with a good friend of mine is R J MISSION PROJECTS. We fund the needs of some international seminarians at St. Meinrad Seminary and some small projects in the island missions. 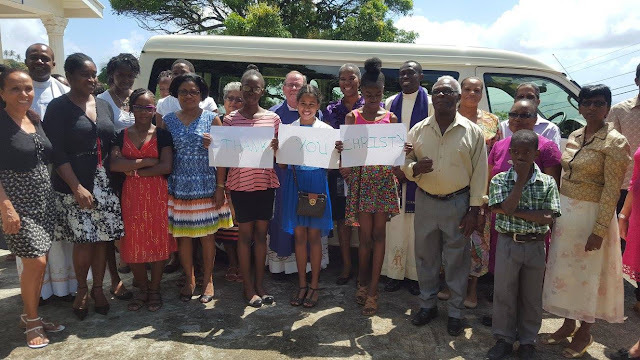 I recently launched an even bigger organization to connect retired priests and retired Catholic lay people who want to work together to target specific needs in the Caribbean missions. I have started with a chapter in St. Vincent and the Grenadines and another in Barbados at the same time. If all goes well, there may be additional chapters in other mission dioceses. 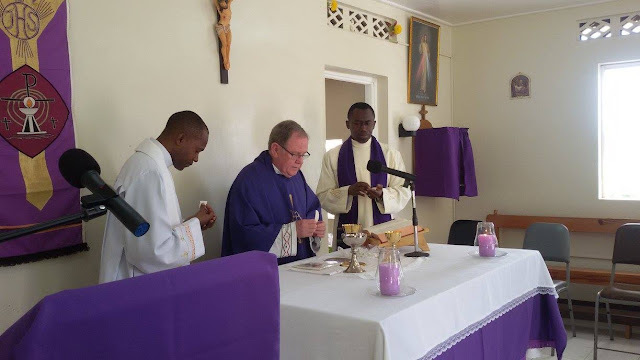 "The Spiritual Leadership of the Parish Priest and Creating a Vocation Culture"
It is noteworthy here to tell you that Archbishop Kurtz, my bishop, taught some of these priests when he worked in their seminary for three years. This is also the home of Dr. Joseph McGowen, recently deceased president of Bellarmine University where I have been doing campus ministry, part-time, for the last 14 years. His sister stills lives here and her pastor is attending this convocation. On the left is a married priest from Puerto Rico, Father Richard Rojas and his son Richard. Bishop Bambera, on the left, speaking to some of his priests at the cocktail hour. On the left is a former Christian Brother, now a priest. On the right is a priest originally from the African country of Cameroon. A heart-to-heart discussion with the bishop. This was inspiring to watch. This bishop has a wonderful relationship with his priests. The bishop was a priest of the diocese. Going home this afternoon through Chicago. Will be home late tonight. A week off and then it's the Diocese of Monterrey, California! Doing my thing - talking about how important it is for vocation promotion to build a healthy unified presbyterate and how the two are connected. "The Spiritual Leadership of Priests in the Universal Call to Holiness"
Look at how many priests they have working in the vocation office - one full time and ten priests part-time and one lay person! This week, they are attempting to get all the priests involved in promoting vocations. Eating well, three times a day. The church goods people follow priests around to their conventions. There are two companies here this week vying for attention. No one wants to be seen eyeing the bishops' and cardinals' zucchetti (beanies or skull caps) with lust, but everybody looks! Evening Prayer - left side of the room. Most of "the committee" are the same as last fall. Msgr. David Bohr, right, was my contact person, airport pick-up guy and head of the convocation planning committee. Father Don Williams, left, is the diocesan Vocation Director and head of the Vocation Team. SCRANTON, PENNSYLVANIA, HERE I COME AGAIN! I am back in the Pocono Mountains of Pennsylvania, at the famous Skytop Lodge, to lead the second half of the Scranton Diocesan Presbyteratal Convocation. We will go from noon today, April 18 through noon Thursday April 21. I led the first half of the presbyterate in their convocation last year from September 13-17, 2015. Last week, I was in the beautiful island missions of the Caribbean and this week I am in the beautiful Pocono mountains of upstate Pennsylvania. The difference is almost shocking. I enjoy both for different reasons. Here is a side-by-side comparison - not too far from reality, even if a bit dramatized. Both are beautiful in their own unique ways. I love the people down there and I hope to keep going back. A home on the island of Bequia, SVG, that I walked past last February. I asked permission to take the photo. He told me that it was OK.
Bishop's Residence, Diocesan Offices, Chancery Office and Retreat House. It is a solid building in desperate need of renovation and updating. The kitchen of the Pastoral Centre. One of the Guest Rooms at the Pastoral Centre. One of my dreams is to lead an effort to renovate and update the Pastoral Centre. This week at the Skytop Lodge in the Pocono Mountains of Pennsylvania. A grand old hotel for the rich and famous of New York back in the 1930s. What I am doing, it occurred to me, is being a Robin Hood. The money I make doing priest retreats in the United States and Canada, I use for my travel expenses and projects in the missions of the Caribbean. As tired as I was from the busy trip to Barbados, St. Vincent and the Grenadines and Trinidad, I must say I enjoyed last night's peaceful sleep and coffee this morning on the porch of this grand old hotel. Maybe this is a good balance. I get rested up in places like this to be able to do what I do down in the islands. One thing for sure, I am not bored in my retirement, even though I go through a bit of cultural whiplash as I move around. I must admit that I enjoy this luxury once in a while. I certainly did not grow up in it. For the priests here, it is a treat, not a way of life. After working hard all year, they are treated to a week's retreat in this nice place. When I am in a place like this, I wonder if I should have been born rich instead of merely smart and handsome! Haha! One end of my room. The other end of my room. One of the many porches for relaxing. I now look forward to greeting the bishop and priests who will be arriving this afternoon. Last fall I was with half of the presbyterate. This time I will be with the other half of the presbyterate. The delightful bishop of the Diocese of Scranton. 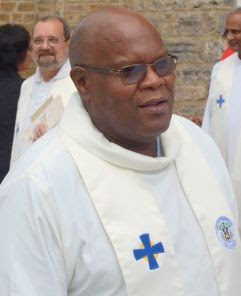 Bishop Joseph Bambera.